I remember the first ‘happy mail’ I received for publication work like it was yesterday… Twirling my office chair around, spinning in glee. 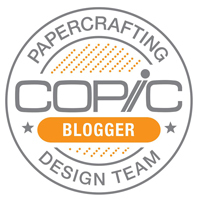 Like so many in the papercrafting industry, I was saddened to learn that this beautiful publication is ceasing operation early next year. 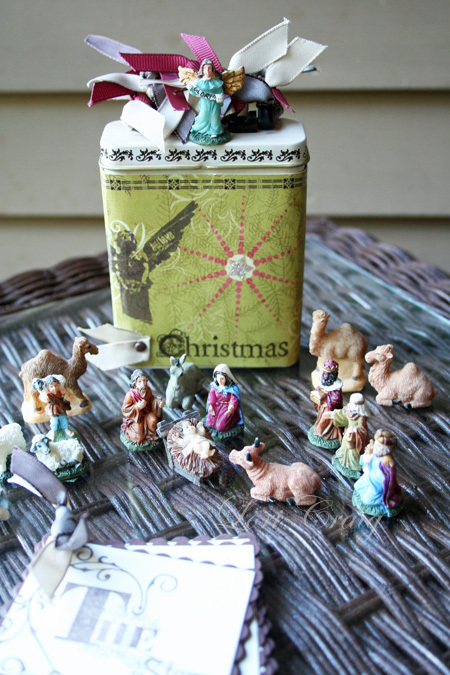 I created a little book that slides inside the tin with the pieces of the Christmas Story, and I love taking this out year after year. These past few years, I’ve been setting it under a glass cloche dome. 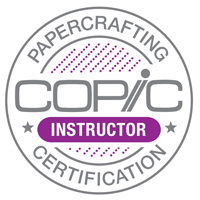 Thank you to Paper Crafts for inspiring me to create and for encouraging me to strive to do more with this crazy little hobby over the years. You’ve brought such joy to me through crafting and friendships through the years. Many of those paper crafting friends are celebrating and hopping today in honor of Paper Crafts. The next stop on the hop is from my dear partner in Splitcoast crime, Lydia! 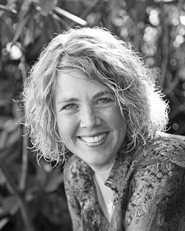 I hope you’ll read her post… it’s spot on! Much love to all of the hardworking editors and support administration who will be making a new way in the industry we love. I wish you nothing but the best! It’s been a little quiet here on my blog. I realize that, and trust me, I’ve missed getting inky. Several members of my family have kept me hopping the last 10 days with broken bones, doctor appointments and hospital stays. Thankfully, everyone is going to be just fine in 6-8 weeks (I’m so very grateful! ), but it sure has cut into my therapy crafty sessions. 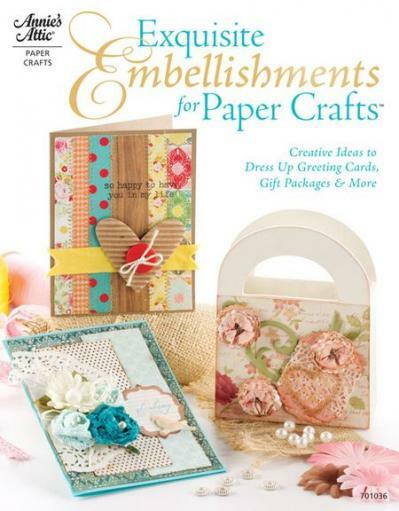 Today I’m excited to share the newest publication from Annie’s Attic, Exquisite Embellishments for Paper Crafts. I was honored to share a project in this collection put together by Keri Lee Sereika because I love the idea of creating your own handmade trinkets to cards and paper projects, and Annie’s Attic books are always so beautifully done. 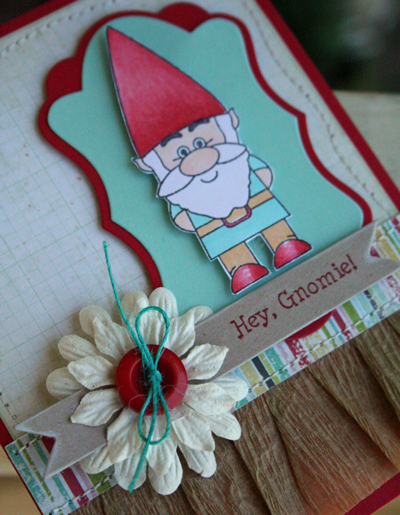 Here’s a snippet of my project that’s in the book, Hey Gnomie! I love this little guy, illustrated by Tami Mayberry. Isn’t he sweet? I’d love to snag a little crafty time this weekend, but to be honest, we’re in the middle of some painting and a little remodel in my office and kitchen (because we don’t know how to do anything easy or simple at the Craig house – so, sure! let’s tear up the house and run back and forth to the hospital and doctor appointments at the same time! ), and the entire contents of my craft studio/office are stacked in my dining room. I’d share a picture, but the chaos really is enough to upset your stomach. When we’re done, I’ll do a new stamping space tour. I really can’t wait!! In the meantime, here’s hoping I’ll have a CPS sketch sample to share with you on Sunday. Keep your fingers crossed! 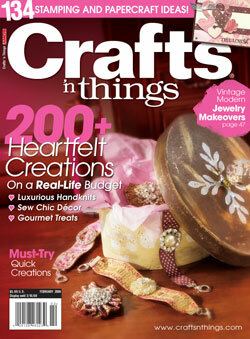 Here’s a project that I was excited to have featured in the this month’s new issue of Crafts N Things. It’s a card that I made for my sweet hubby a while back. 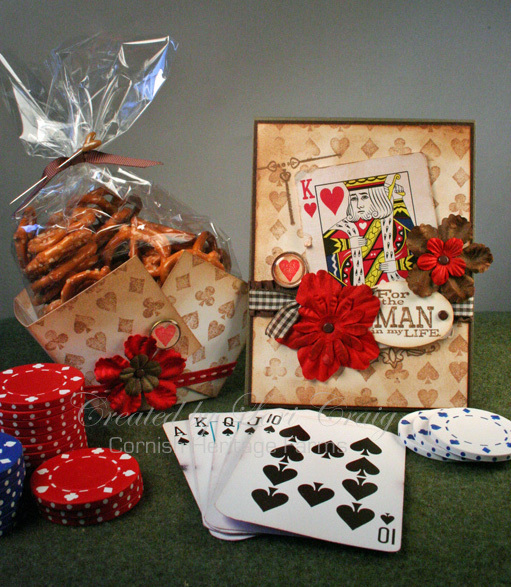 I used my Scor-Pal to create a ‘oh-so-quick’ nut or popcorn or pretzle cup. Stamps are ‘For the Man’ and Card Suits backgrounder from CHF. 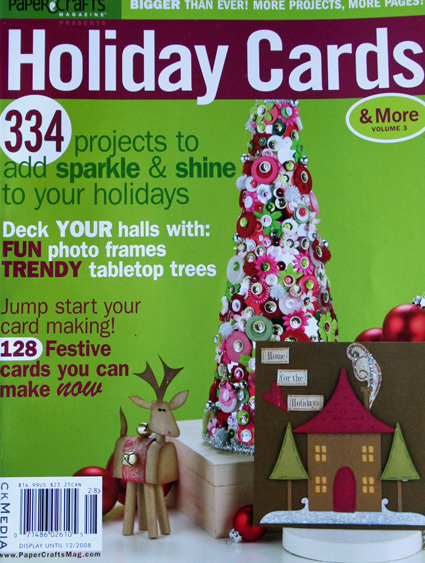 Here is a project that my mom and I teamed up on for the current November/December issue of Crafts & Things. 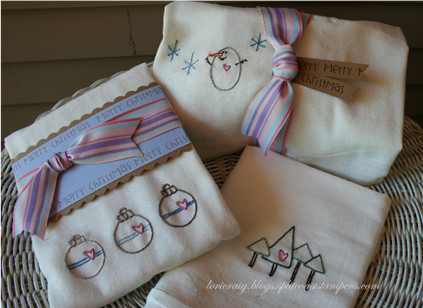 Mom embroidered the designs on this tea towel set, and I finished them off with tags and wraps. The top right towel is wrapping a loaf of bread. It was so fun to work together on this. I hope we can do it again. 🙂 Crafts and Things is full of great ideas with easy to follow step-by-step instructions. You can generally find it at your grocery store or Wal-Mart.